Zebra barcode printers are becoming more and more commonplace in manufacturing and industrial fields. Companies require barcode printers to print labels for shipments or product tags. Although it is always beneficial to have thermal label printers on the factory floor, these expensive printers cannot be exposed to dust, dirt, or splashing non-corrosive fluids. A dust-free printer enclosure is the perfect solution for protecting a barcode printer from harsh particles and elements. When researching a viable solution, what should the enclosure include in order to be functional? A shelf that has the ability to slide in and out of the enclosure is ideal for changing the print media and labels. Before installation, determine the weight of the printer to make sure that the shelf can support the load. The enclosure may need to be mounted to a desk or flat surface, so that the combination of the sliding shelf and printer do not cause a tipping hazard. A sliding shelf is essential because most Zebra barcode printers are only loaded - with ribbon, media, or labels - on the left or right side. It is important that the side of the printer can be easily accessed. Without a sliding shelf, the entire printer would need to be lifted out of the enclosure to be serviced, which would not be a simple or efficient task, especially if a company uses a large number of labels per day. The front door on the enclosure should have a slot for the labels to exit the enclosure. If not, the door will have to be opened and closed every time that labels are printed. Constant opening and closing of the door will negatively affect the enclosure’s seal and could expose the enclosure to severe environmental threats. There should also be options for the location of the slot on the door at varying heights. 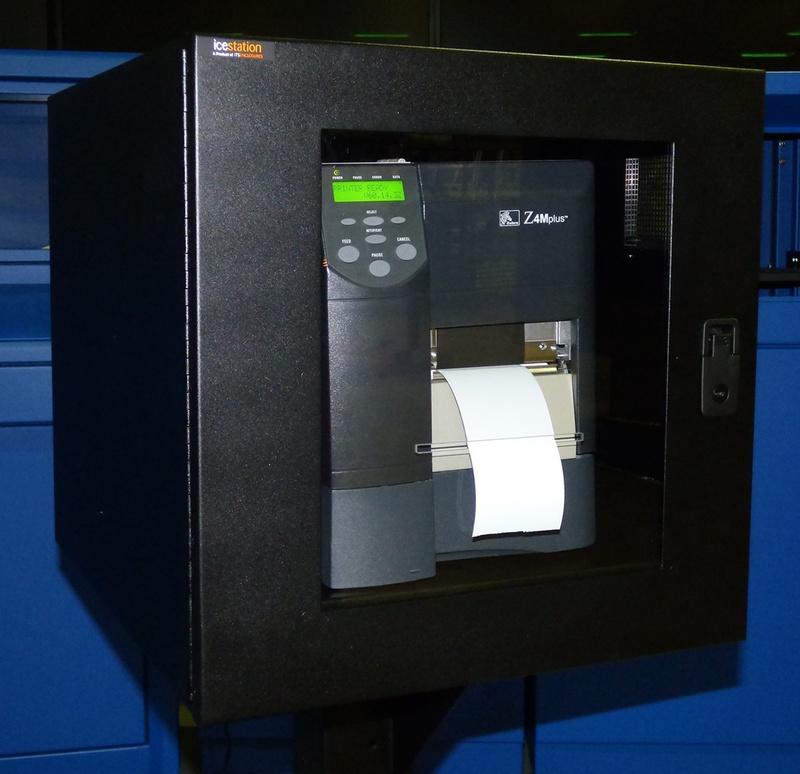 Zebra printers are available in many different sizes and the height of the slot is vital for efficiently feeding the labels out of the enclosure and minimizing waste. 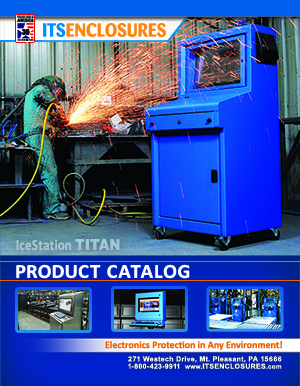 Work with an enclosure manufacturer in customizing the label slot location that works best for the users of the system. Without access to cable management, the unit cannot be powered. In order to maintain a clean, dust-free enclosure, cables and wiring must enter and exit the enclosure through a sealed opening. The enclosure should include some variance of a fastener secured split panel that will prevent dust or dirt from entering the enclosure. A sealed gland cable entry may also be used to protect from any splashing fluids or liquids. Dust, dirt, and liquids will destroy the electronics housed inside of the enclosure. It is a good rule of thumb to keep these contaminants away from the enclosure. The front door of the enclosure should be lockable with a tightly sealed latch to further protect the electronics and eliminate users from changing the printer settings. Simply put, the lock will provide the necessary security. A window, on the door, is also helpful, because it will provide the maximum viewing of the printer’s display and offer a way to watch and monitor the labels as they print and feed out of the slot. As with any enclosure project, make sure that you have the exact dimensions of the printer or electronics that you will be housing inside of the enclosure. Also, make note of the entire wattage of the electronics, in case you will need to add thermal management, either for cooling or heating. Most enclosure companies will supply a thermal management worksheet that can be filled out in order to determine if a filtered fan system is adequate, or if an air conditioner or vortex cooling unit may be necessary. Filtered fan systems create positive pressure and will prevent any dust or dirt from entering the enclosure through the label access slot. Research everything before deployment, so that the solution will be the perfect fit and last for many, many years! Avoid Computer Enclosure Startup Pitfalls with the Proper Planning!